Following a 17-month outbreak of salmonella poisoning that sickened at least 600 people around the country, a Dept. of Agriculture advisory committee will meet tomorrow discuss strategies for effectively controlling the spread of salmonella in poultry. In advance of that meeting, two members of Congress are calling on the USDA to take a three-pronged approach to fighting drug-resistant bacteria. The first new approach, is for the USDA to take a less hands-off approach to recalls involving salmonella-tainted chicken. 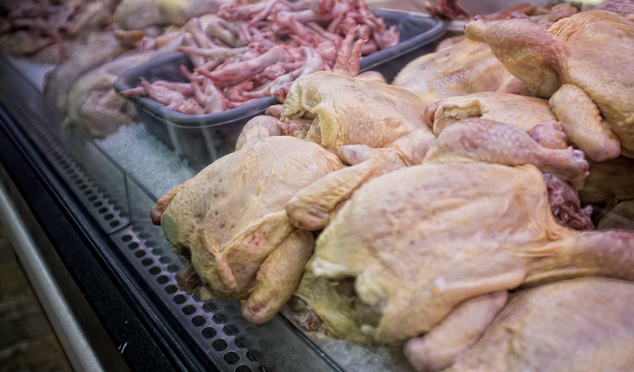 While the USDA has authority to recall “adulterated” chicken, one of the roadblocks to actually issuing a recall for meat tainted with salmonella is that you’ll find at least some level of the bacterial pathogen in any raw meat poultry. The laws regarding adulterated beef and poultry include a loophole for alleged adulterants that are “not an added substance.” Since salmonella is commonly found in chicken the USDA has been reluctant to issue large-scale recalls, even when that pathogen is a variant that is resistant to multiple drugs. The other thing the USDA can do is push for farmers to reduce their reliance on antibiotics for meat-producing animals. Antibiotics are often used in low-dose amounts for non-medical purposes because of their growth-promotion effects. Some proponents of antibiotic use claim that this continual sub-therapeutic deployment of the drugs is needed for disease prevention, but many scientists say this prophylactic approach to animal antibiotics only results in the development of drug-resistant versions of salmonella and other bacteria. While we recently showed that it’s possible to cook beef to a temperature that is generally considered safe (without resulting in shoe leather), tests by our colleagues at Consumer Reports turned up some bacteria that produce a toxin that would not be destroyed through the cooking process. The representatives have introduced a bill to clarify that USDA has the authority to declare multidrug-resistant pathogens as adulterants so they can be recalled. In their letter, DeLauro and Slaughter, who is a trained microbiologist, say that too much burden is being put on the end-user to protect themselves.